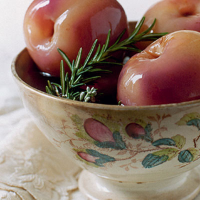 Soft, white peaches, lightly poached in a rosemary-infused muscat wine, are a true evocation of summertime in the Languedoc-Roussillon countryside. Make sure the peaches you buy are not over-ripe – this is a rare instance in which it helps if they are still firm to the touch – and serve with macaroons. Wash the peaches well but do not peel them. Place them in a lidded, heavy casserole in which they fit snugly, and add the wine. It should just cover them – if it doesn’t, turn them halfway through. Heat slowly for 20–25 minutes and, when the liquid comes to the boil, remove from the heat and pop in the sprig of rosemary. Cool and serve tepid. The muscat you have used in the recipe is the best partner here. Follow it with this forceful and intense coffee from Indonesia.